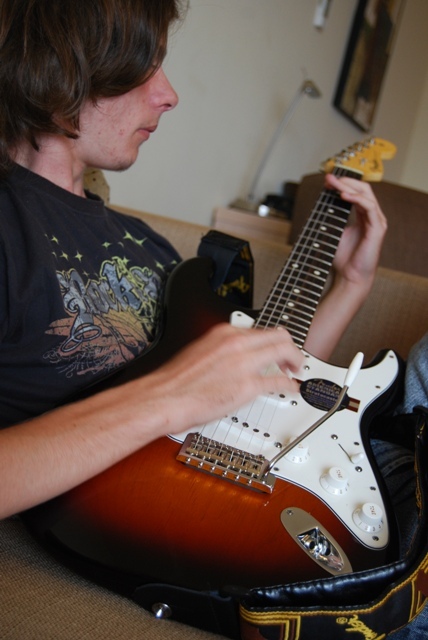 Pip has been saving his money for almost two years to buy himself a new electric guitar. He has not spent his birthday or Christmas funds and you should never under-estimate the change from a weekly lunch at school as a source of income. There’s only one shop in Townsville where he might have spent this money, but when he went in there the salesperson was less than helpful and the range so small and the prices so high that he left without spending a cent. Yesterday we visited a music store here in Melbourne. One with more guitars in more shapes and colours than we could even imagine. Pip knew exactly what he wanted. He asked, test-played and was happy. But… when we asked for a hard case in order to bring it home on the plane there were none. The salesperson didn’t want us to leave and offered us the next level of guitar. It came with a free hard case, but a hefty increase in price. To compensate for the extra cash required he gave us a huge discount. How could Pip say no to that? Aww- what a lovely story. I can imagine how much he loves it! How cool! Wonderful – yeah I always wondered what happens to all that change!! Cool, glad that worked out well. We certainly are. I love this city. It will be even more so once he gets home to his amplifier. 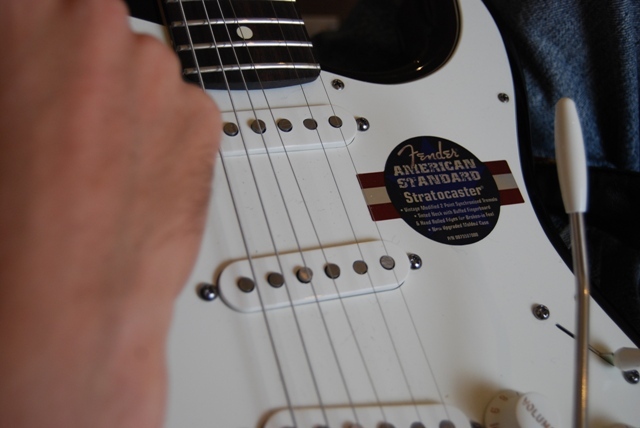 My boys are impressed that Pip has purchased an American Strat! They’ve only afforded Mexican Strats. He went in with a Mexican in mind, but the smooth talking salesperson did his work. Wonderful! I really admire people who know what they want and work hard to get it. Respect! He has been so stingy with his money for two years as he worked towards this. He has literally gone without quite often in order to achieve this goal. Ah, the power of delayed gratification! I hope he loves his new guitar! He certainly does love it! A Fender! Nice!! Well done saving the money too. I’d have blown it long before I managed to have nearly enough for a guitar. He has amazing self-control and will power. Awesomely cool instrument! There is nothing like finally spending hard saved money on something you really really want. Well done and may he enjoy it to no end. It has bought him so much enjoyment in the past few days and he doesn’t even have his full set up with him!